The Control Panel and Device Manager are two (2) of the most important tools on your computer that will help you troubleshoot problems in network connectivity. This article will show you various ways to access the Control Panel and Device Manager on Windows 8, 8.1 and 10 operating system. Control Panel is a part of Windows-based operating system which allows users to control the basic tasks and features of Windows through applets. Applets include Programs and Features, Device Manager, Network and Sharing Center, etc. 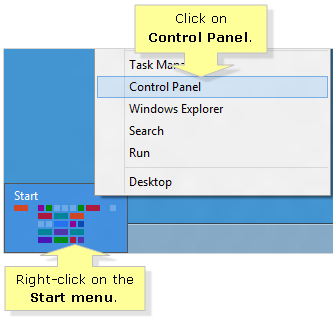 Right-click on the Start menu icon then click Control Panel. NOTE: The Charms bar is only available to smart phones and tablets. Hover your cursor over the top-right corner of the screen to unveil the Charms bar then click on the Search charm. Enter “control panel” then select Control Panel from the search results. 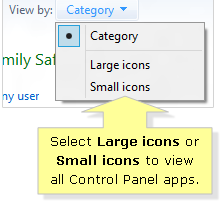 To display all apps available in Control Panel, select either Large icons or Small icons in the View by menu. 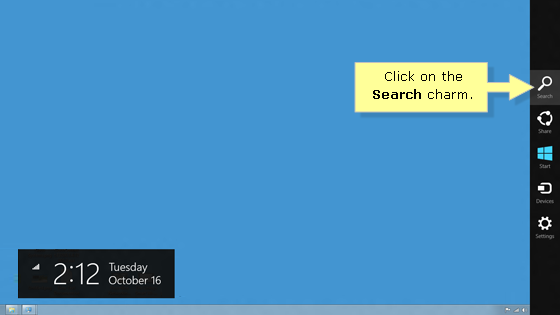 To show the Start menu from the desktop view, hover your cursor over the bottom-left corner of your screen. Right-click on the Start screen icon then click Control Panel. 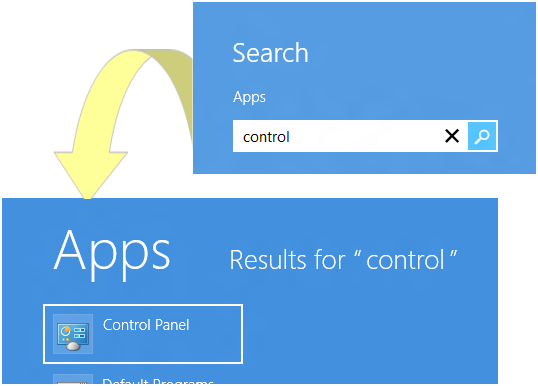 Enter “control” then select Control Panel from the search results. 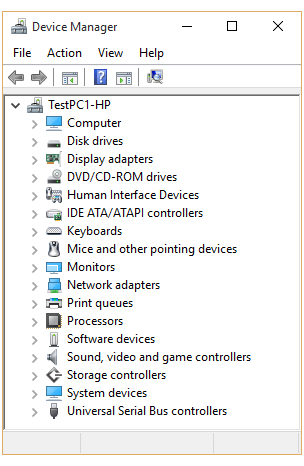 Device Manager is an applet for Windows-based operating systems that allows users to check the status of the peripherals that are connected to the computer. You can manually install drivers of an Ethernet or wireless adapter through the Device Manager. However, hardware manufacturers provide installation software that will automatically install the drivers of the adapter. 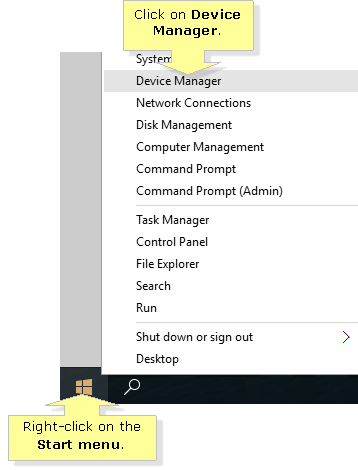 Right-click on the Start menu icon then click on Device Manager. 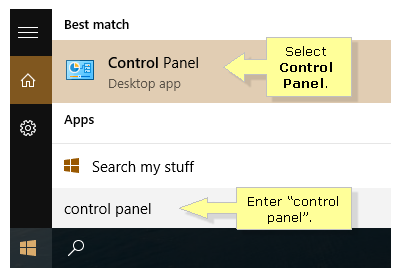 Right-click on the Start menu icon then click on Control Panel. Depending on your computer’s specification, the devices connected to your computer will be displayed in the Device Manager once they are detected by your computer. To show the Start screen icon from the desktop view, hover your cursor over the bottom-left corner of your screen. 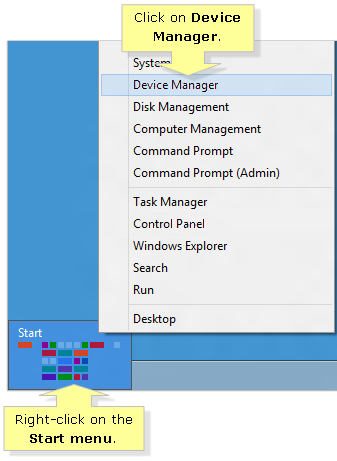 Right-click on the Start screen icon then click on Device Manager. 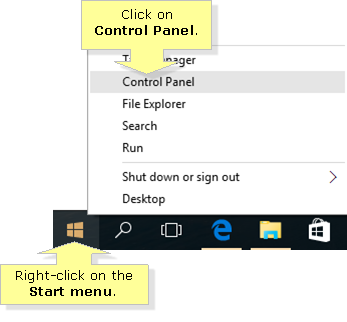 Right-click on the Start screen icon then click on Control Panel.